Everyone wants their WordPress website to be original. Otherwise, how else are you going to stand out from the competition and build a devoted audience, right? While true, at the same time, there are also some specific types of content/pages that all readers expect to find on a website. Today, we talk exactly about those pages! Here are the WordPress blog pages that you should consider creating. Note. Of course, you might not need every single page that’s listed below, so feel free to pick and choose according to your needs and the purpose of your site as a whole. About is one of the most common WordPress blog pages out there. You will basically find it on every WordPress site you visit. Why? Because people want to know what’s going on behind the curtains and who’s responsible for the content that they’re reading. People just tend to be more supportive when they learn something about you, your business, and can relate to you in some way. Being faceless is never good for building a brand online. Okay, so creating a quality About page is about much more than just gluing some random text together and hitting the publish button. Here’s some advice on how to build a proper About page: by Derek Halpern and by Tom Ewer. Along with About, Contact is also one of the vital WordPress blog pages. If you don’t have it, you don’t exist. Okay, harsh, I know, but it’s really the case online. People simply need a proof that they can reach out to you if they have an opinion – a proof that they are listened to. By putting your contact details on your blog, you can create a strong connection with your audience – a two-way communication. Your readers don’t appreciate anything more than knowing you are just like them, a normal, approachable human being. While building your contact page, don’t forget to add a nice contact form to it. Nothing advertises you better than your actual work examples. I mean, you can write stuff about yourself, about how great you are, but no one will take you seriously until they see for themselves. The internet is full of people who want to stand out somehow, so show everyone the things you do. Potential clients want to see concrete examples of how good your skills are when turned into actual work. People with portfolios are more likely to get attention than those who just say things. Here are some portfolio page ideas for you. So now you have all the info people need in order to give you enough credit. But, since you probably want to monetize your site somehow – be it via attracting clients, selling products, or whatever – you definitely need landing pages, or at least one. Landing pages can do a great job of convincing your visitors to take specific actions on your website – actions which then bring you business directly. There are a couple of ways in which you can create landing pages in WordPress. The easiest one is via a drag-and-drop content builder plugin. Then, don’t forget to get to the bottom of what makes a landing page convert. The “Getting Started” page can be a great way to speak to new visitors and point them toward all the interesting things that can be found on your site. A good “Getting Started” page should highlight your most popular content, your best products, and anything else that you think is crucial for a new visitor to learn. It’s also a good idea to link your “Getting Started” page to the About page. As a website owner, you shouldn’t skip this one, and no matter if you’re a blogger, writer, or run a business of any other kind. If you want to grow your blog and increase your revenue, advertising is one of the least complicated ways to do so. What to put there? Just the basic details that an advertiser can be interested in: what advertising packages you offer, what the cost is, what sort of results the advertiser can expect. 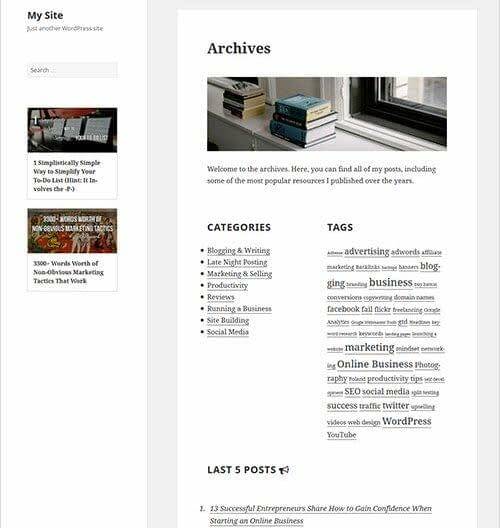 For a blogger/writer, a good archive helps readers a lot, especially if you’re delivering big amounts of content regularly. Having everything organized in very specific categories will allow people to sort through your content much easier and find topics without getting lost among those tons of information. Here’s a handy guide on how to build a great archive page on WordPress. Another option to make money online is to build an online shop, be it selling products created by you, by other contractors, or even selling services. Physical stuff vs digital … the possibilities are endless. It’s very easy to add a shop section to your WordPress blog pages nowadays through the free WooCommerce plugin. 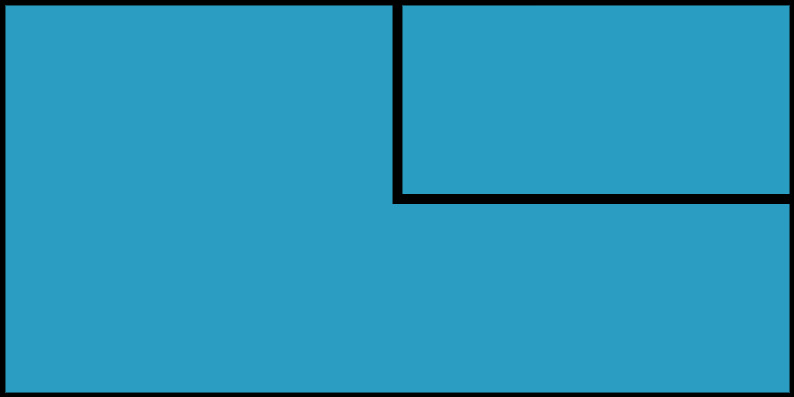 The Resources page is a place where you get to share curated lists of useful resources and/or tools with your audience. Those should be the tools that you recommend to your readers – tools that can help them achieve whatever goal. The key here is quality. You shouldn’t just recommend stuff for the sake of it, but only focus on the things that you’ve tested yourself and that have worked for you really well. If you’re a freelancer and you’re available for work, you should make it clear via a “Hire me” page. It’s very important for someone who wants to hire you for a project to know the details of working with you from the start. Presenting your prices and the range of your services builds trust and shows professionalism. This is only for those who have something in the works, side projects or just a big project coming out. 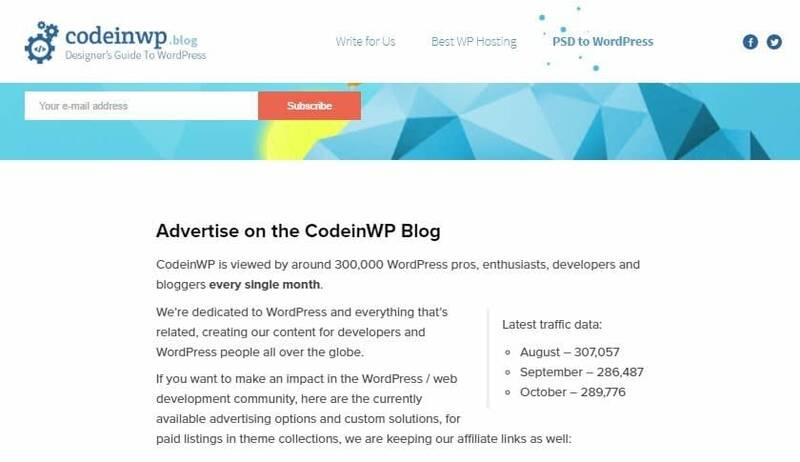 If you’re creating a tool, launching a book, hosting an event, contributing to a great campaign, if, if, if… This type of WordPress blog pages can contain a lot of things depending on what your professional plans are. An affiliate program can be a very effective way of growing your sales, albeit at the price of giving out part of the earnings to your affiliates. A good affiliate program page should list all the details and rules of the affiliate program, the payouts, the benefits of working with you, etc. But most importantly of all, it needs to do a good job at convincing people to join your program. Note. When it comes to the program itself (all the inner workings), it’s best to just hook everything up to a third-party system. Even though you might not be considering launching a podcast right now, you need to keep in mind that podcasts are all the rage these days. They’re probably the most popular content type of the past year, and that growth doesn’t seem to be stopping. Certainly, consider this for the future when your blog starts gaining traction. Podcasts are fun and allow you to meet awesome people in your community, from whom you and your listeners can learn awesome tips and tricks. 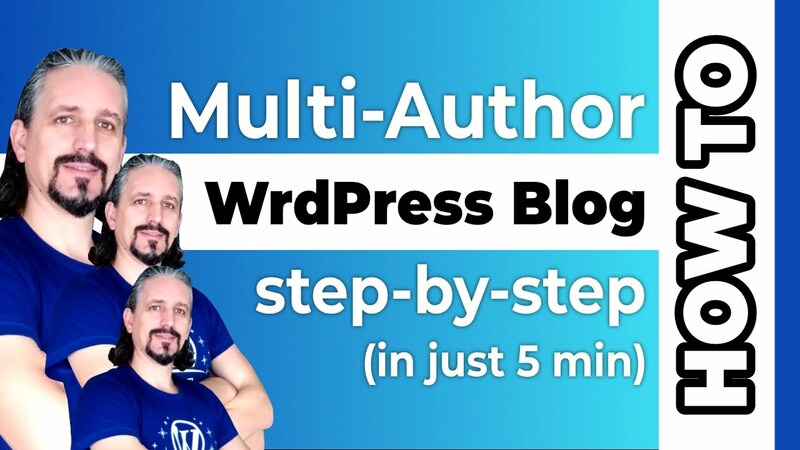 Building a podcast page in WordPress – and even integrating WordPress with podcasting – isn’t a complicated thing. We have a guide on that. 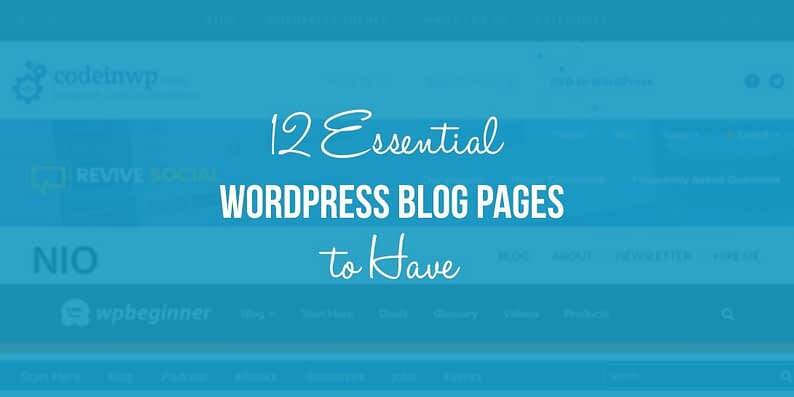 So that’s it for our list of essential WordPress blog pages to have. If there’s anything you think we missed, feel free to let us know in the comments section below.